Last month, I headed over to Toronto, Canada for the second ever Beanstock Coffee Festival. If you haven’t heard of it already, Beanstock is like a craft beer festival, but for coffee. In Canada, craft beer fests aren’t just about the brews, but the environment you’re drinking in - the music, the food and the good times that come along with it. The whole purpose of Beanstock is to create something just as engaging for the coffee industry and bring the community together, while putting a spotlight on the specialty coffee industry. Oh, and it’s not-for-profit, which we love. We happened to find Beanstock on Instagram earlier this year, and as we started reading and finding out more about it, we felt connected to the mission of the festival. We’re all about building a sense of community in the specialty coffee industry back home, and spreading our knowledge around and learning from others. Beanstock seemed like a great fit. We’ve been lucky enough to have a bunch of wholesale accounts in Canada now, so it was a great opportunity to head over and meet the cool Canadians who have been buying our coffee as well. It was so exciting to see how well Floozy was received by the Canadian coffee industry. All of these cool people with cool accents knew my name and wanted to drink our coffee - that was pretty unreal. 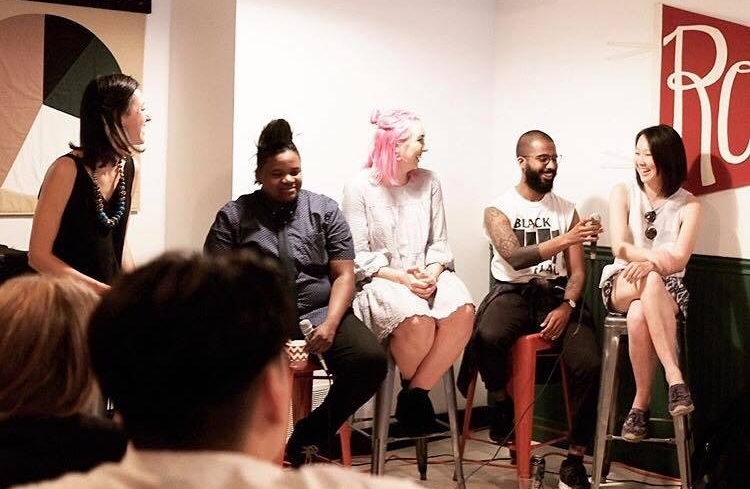 I had the opportunity to speak as a panelist for the Specialty Coffee Association over the weekend and at an event called Unfiltered the Thursday night before the festival, where I got to chat about the role of women in the coffee industry and our journey as a small business start-up. Such a great chance to share the Floozy mission on the other side of the world! Grant Gamble of Mountain Coffee, organiser and co-founder of Beanstock Festival and huge Floozy fan. Grant: Before we even start, you might not realize this, but it was a big deal for the Canadian Coffee Industry that Floozy had a presence at Beanstock. We get roped in with the states as ‘North America’ and get forgotten about, so it meant a lot to us that some reputable international brands came to Beanstock, like yourselves. The Floozy brand and what you and Kmac stand for resonates with our market and has already inspired so many females to make their presence known in the industry. Cill: That’s really kind of you, we were so stoked to be able to be there and connect with so many amazing individuals. What was your highlight of the weekend? G: Aside from meeting Cill from Floozy? Seeing so many familiar faces under one roof, and all of the new faces eager to nerd out about coffee. C: What inspires you the most? G: People who aren’t afraid to take a chance on their passions. G: Coffee… duh. I’m most passionate about making specialty coffee accessible and ‘cool’ in the eyes of the general public. Most people - especially in Canada - only see coffee as a way to wake up in the morning and drink it out of necessity; when really it’s just as complex as wine. I want to see our society respect coffee as they do so many other craft industries. C: What does the perfect cup of coffee look like to you? G: That’s a given…did you see the reaction to your coffees at Beanstock?! Honestly the perfect cup of coffee has as much to do with the environment as it does the coffee itself. Coffee is one of those things that brings people together, so the perfect cup to me is shared with someone you adore, or at least don’t hate talking to. C: Where do you see the Canadian coffee scene heading? What’s something the Australian coffee industry can learn from Canada? G: I think that Canada has a ways to go before the overall quality is as high as Australia’s. There is a tight knit community growing quicker each year trying to set that bar much higher for the whole country. Canadians are starting to experiment more, get out of their comfort zones, and take chances instead of following trends set in other countries. At least from our conversations, I think Aussies could learn to collaborate and continue to build an inclusive community like we have here. Most of the roasters and shop owners here are good friends and are open to sharing knowledge and techniques as opposed to keeping it secret and competitive. I really hope that we start seeing roaster collabs in the near future, the way that brewers do in the craft beer industry. C: Last question: who’s your favourite Floozy? Cill or Kmac?